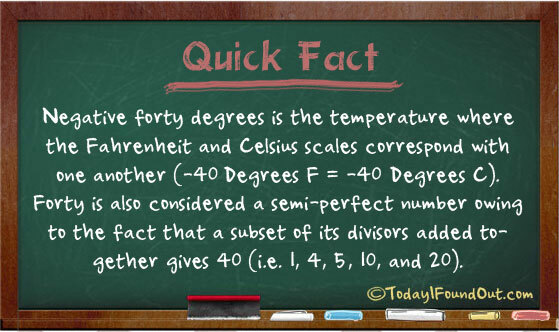 Negative forty degrees is the temperature where the Fahrenheit and Celsius scales correspond with one another (-40°F = -40°C). Forty is also considered a semi-perfect number owing to the fact that a subset of its divisors added together gives 40 (i.e. 1, 4, 5, 10, and 20). Add all those and they equal 42. Anyways- it was cool while it lasted. We also can’t forget 8…. Making the total 50.